The American Embassy in Lebanon is hosting the US-Lebanon ICT Forum on Oct 14-15, 2010 at BIEL, Lebanon. The forum will showcase 60 ICT companies, and will feature a series of seminars about trends in the technology and communications sector. 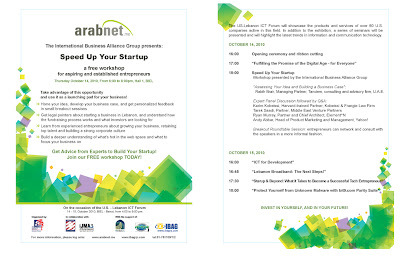 If you happen to be an entrepreneur, you might be interested to know that the event will include a free entrepreneurship workshop by ArabNet called "Speed Up Your Startup".